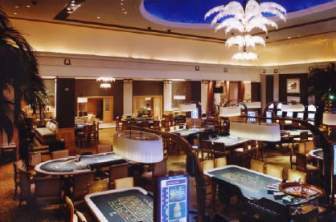 The Palm Beach Casino is undoubtedly one of the more prestigious London casinos and used to be a relatively exclusive gambling location in the heart the nation's capital. These days it still has an upmarket feel but is a little more relaxed in terms of clientele. The casino is actually owned and run by Genting, one of the world's largest entertainment companies. The same group look after Maxims, Crockfords and Aspinalls in the UK and also operate a very successful online casino with hundreds of games. For the casual visitor, Palm beach Casino is easy to find - just get off at the Green Park tube station, just off Hyde Park, and head towards Berkeley Square. If you are in the area during the later hours of the day you need not fear - the Palm Beach casino is open 24 hours a day, seven days a week. Palm Beach offers a wide range of services and amenities in order to keep gamblers busy. With a superb restaurant (I had one of the best Asian-fusion meals I've ever had in London at Palm Beach) and a busy modern bar area, seperate poker rooms and a wide variety of games this casino really ticks all the boxes that a gambler could ask for when looking for a great casino night out. After visiting an endless amount of gambling floors around the UK I sometimes get a feeling whenever I visit a place that grabs my attention instantly. The gambling floor at Palm Beach is one of those places - with a classic design and layout, this casino stands out above the crowd and feels a bit more 'classy'. In fact, I was worried that my somewhat informal dress code might not fit in and it is true that I felt a little under-dressed the first time I attended (jeans and jumper!) but the dress code isn't so strict that you feel unwelcome. If you combine this feeling with the game selection you will quickly understand why the Palm Beach Casino is so popular with gamblers. Starting off with a bunch of American Roulette tables, the floor moves on to Blackjack tables, Three Card Poker, Baccarat and a series of dedicated Poker tables. The spacious layout makes it a good place to bring a slightly larger crowd to your table if you decide to bring friends along. Some gamblers might be looking for a more modern approach to gambling - and the Palm Beach does not disappoint. With a great deal of electronic Roulette machines we really see a diverse and modern selection of games. Starting the night off with a glass of fine whiskey might just be a personal preference - but if you are somewhat like me then you will really enjoy the bar at the Palm Beach Casino. Their selection of spirits, beers, wines and cocktails is great, making it the perfect place to kick-start your night. But the bar is also an excellent place to get away from the gambling floor for a while, gather a bit of energy in order to hit the tables once again. Food is a big part of what the Palm Beach Casino has to offer - and there are two places where you can eat. The bar area offers lighter snacks and smaller dishes, a perfect option if you just need a quick break rather than a sit-down meal. The real culinary highlight is the restaurant - heavily influenced by the international clientele of the casino. Dishes from all over the world can be found on the menu, making it a great place to have your evening dinner - even if you are not gambling. With lunch being served from just before 12 noon, food service continues all the way until 02:30 in the morning - leaving gamblers and visitors more than enough time to grab a bite during a day-session at the casino. If you feel like stepping out for some air, or a cigarette, then the smoking terrace is highly recommended. With heating outside it makes for a nice break from the bustling life inside the casino and can serve as a nice wake-up call for the tired gambler. The Palm Beach Bar is the place to be on a Sunday night. From 22:00 an Arabic themed party kicks off, with a DJ, belly dancers, Arabic Mezze and electronic Shisha. This highly popular event takes place on a weekly basis and we would recommend that you call in advance if you want to book a table as it can get quite crowded. Parties and themed nights run throughout the year, many of them being seasonal. In terms of promotions we recommend that you sign up for their Loyalty Scheme, connected to the Genting Reward Scheme. This gives you access to promotions and offers throughout the year - as the casino itself does not market many events, tournaments or promotions on its own. This might be the only major thing that I do not really like about this casino. Why the Palm Beach Casino London? Casinos in the southern part of the UK have a reputation for being entertainment venues - something that is not completely true when it comes to the Palm Beach Casino. But this might not actually be a bad thing - it means that they focus on what is important. In the eyes of a gambler you want a great selection of games, good service and the occasional drink. The casino fulfills these requirements excellently and in some respects goes above and beyond, especially if you take the restaurant in to account. With operating hours running around the clock it is a great place for a good night out and if you are looking for a Middle Eastern touch in your life then we highly recommend the Sunday event. Tournaments and promotions are not as apparent as we would like them to be but looking at the bigger picture we see this casino as a great place to visit.